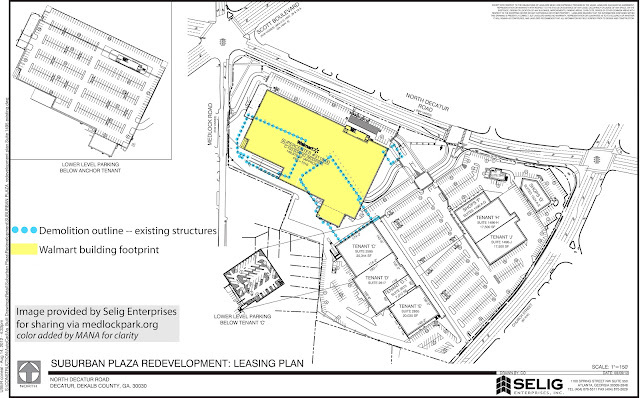 While the initial reaction the renovations to northern Decatur’s Suburban Plaza shopping center ranged from mixed to downright negative due to the controversial addition of a Walmart to the location, the Medlock Area Neighborhood Association yesterday released new updates on redevelopment plans. And while the contentious Walmart is still slated for installation, much to the chagrin of some residents, the news wasn’t entirely discouraging. In an attempt to embody the concerns and spirit of the community, Selig Enterprises, who manages the property, has announced that the new construction will incorporate sustainable building materials, feature wall-sized murals by a local artist, house several small, permanent booths to be used by artists or small-scale food vendors, and attempt to green-up the landscape in the area, currently dominated by an expansive cement parking lot. Selig Enterprises has also hired a traffic engineering expert to assess the potential increase in road activity in the area and attempt to preemptively address any possible problems related to an increase in vehicle activity. Though many in the neighborhood are still voicing concern about plans for the area, it does appear that the company in charge of the reconstruction is responsive to those doubts. More images and information can be found on the MANA website. Work on the project is scheduled to begin early next year and to be completed by the end of 2014. ~ by agentdebby on September 7, 2012. This entry was posted on September 7, 2012 at 12:35 pm and is filed under Uncategorized.You can follow any responses to this entry through the RSS 2.0 feed.You can leave a response, or trackback from your own site.